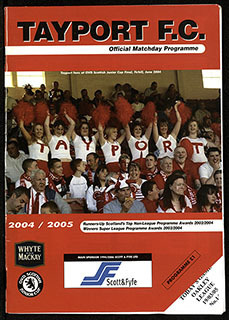 You are here: Home>Blog>Digital archive of match day programmes for Tayport F.C. It’s a veritable cornucopia of Junior football nostalgia, with a good measure of community interest thrown in! We hope the archive provides a model for how smaller sports clubs can preserve and make available their rich history – something that is often the preserve of large, relatively wealthy clubs. The website represents a comprehensive archive of 435 programmes which have been digitised by staff at the University of St Andrews, funded by the club. 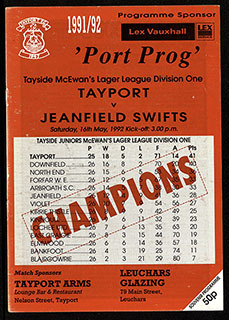 Through the medium of these matchday programmes the archive follows the fortunes of Tayport FC during its hugely successful period in Junior Football from 1990 to the present day. 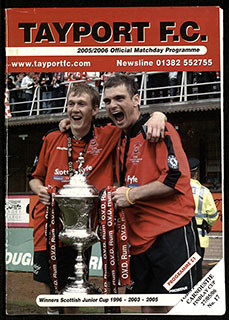 It’s a time in which the club made six Scottish Junior Cup Final appearances, winning three, won two East Region Super League titles, two Premier League titles, nine Tayside Championships and thirty two local and regional cup competitions. As well as showing the value of football programmes and other sporting ephemera in the understanding of local history, the archive is a reminder of the huge role that sports teams can play in their local community. Anybody interested in the history of Tayport FC, or in starting a similar project for their own club, is welcome to get in touch at tayportfcarchive@gmail.com.